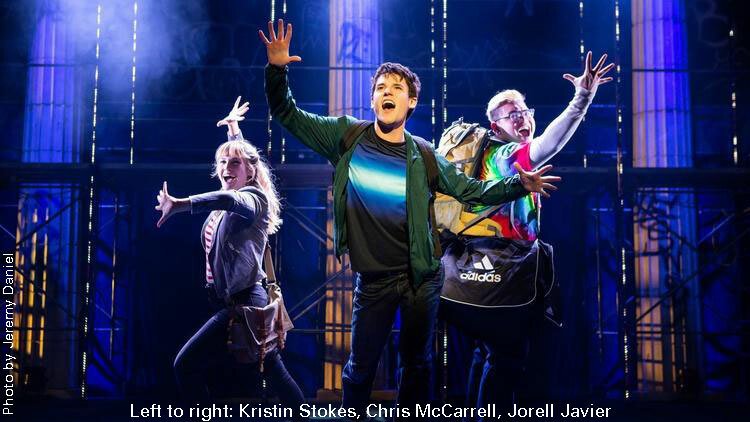 The Lightning Thief: The Percy Jackson Musical grabs the audience’s attention right off the bat, with a sudden loud clap of thunder. The cast launches into the number “The Day I Got Expelled,” which takes place during a school field trip to a museum. During the song, we learn that Percy Jackson has troubles fitting in at school due to his ADHD and dyslexia, and that he’s a half-blood. Percy’s mother decides to send him to Camp Half-Blood, which turns out to be a training facility for Greek demigods — the children of gods. However, before Percy gets there, a minotaur kills his human mother and Percy is knocked unconscious trying to save her. When he comes to, he’s at the camp, where he learns that his absentee father is a god and his best friend, Grover, is there because his father is a Greek god too. Before long, Percy is accused of stealing Zeus’ lightning bolt. From there, he and his friends go on an adventure to set things right. The musical has catchy songs, amusing gimmicks (such as rolls of toilet paper being shot out from a leaf blower), sound effects that include wind chimes, the sea, and the aforementioned thunder, to name a few. The story is captivating, but even more than that, the incredible cast makes this show sparkle. I thought I’d seen the maximum energy a cast can exude during a performance of School of Rock at the same theatre a few months earlier, but this cast of performers goes even further. As Percy, Chris McCarrell is hilarious, yet endearing, as an awkward boy who’s struggling to find his identity. McCarrell perfectly embodies the movements and facial expressions of an adolescent boy. Although the entire cast is spectacular, Jorrel Javier in particular stole a number of scenes, not just when he played Percy’s exuberant best friend, but also when he portrayed Mr. D, the short-tempered camp director who almost jumps out of his skin because the campers annoy him to no end. Meanwhile, Ryan Knowles, who played Percy’s teacher in the opening scene, had the audience in stitches each time he pranced around the stage with a tail attached to his behind as a half-human/half-horse. Later in the show, he hilariously portrayed the Greek god Hades, mimicking late comedian Paul Lynde’s famous speech pattern while doing a Jim Carrey impersonation. Who knew Greek gods could be so funny? The Lightning Thief: The Percy Jackson Musical never fails to entertain, with even the youngest audience members mesmerized by what was happening onstage. The Lightning Thief: The Percy Jackson Musical is currently playing at the Ed Mirvish Theatre. Click here for more information and to buy tickets.